Today’s post is a guest blog by Scott’s client, Jenny Loo. What Jenny overcame is REMARKABLE: an eating disorder lasting 40 years, including bulimia, anorexia, and more, and including stays in $30k/month treatment facilities. My name is Jenny Loo, and I am a client of Scott Abel. I had a chronic eating disorder for 40 years and could never seem to get over my obsession with dieting. I was constantly “on a diet,” because I thought that by being able to control my food intake, I could solve all of my life’s problems. Because of the psychological implications of my eating disorders (which included anorexia, bulimia, and compulsive overeating), I participated in cognitive behavior therapy for decades. Despite all my work in therapy, I was not able to rid myself of my eating-disorder symptoms, so my life continued to revolve around food: what I ate, when I ate, and the number on the scale. I let my entire life revolve around my relationship with food. Today I am free of all eating-disorder symptoms and no longer think about dieting—I no longer believe that controlling my food intake would solve all of my problems. Letting go of my food obsession has allowed me to examine the underlying emotional issues that originally led me to the food obsession. Through my coaching with Scott, I learned how I was using food and dieting as a crutch to distract me from looking at my inner feelings. I used food to mask pain, hurt, anger, and loneliness. Now instead of using food as a coping mechanism, I use my own inner resources to help me deal with life, and to simply function as a contributing human being to society. I am also learning so much about myself—things that I never knew about myself, abilities I thought I never had. I now have a sense of freedom and confidence that I’ve always wanted and thought I’d have “if only had the perfect body.” I no longer need the perfect body to thrive. For nearly 30 years, I weighed 68 pounds. I could not relate to anyone or have any friends, because others perceived my thin, sick-looking body as a person who was chronically ill. I was the loneliest person on earth; I made my food obsession my companion. I think people were actually scared of me, because I just didn’t look or act human. In order to live and breathe at 68 pounds, I had to literally starve myself in the truest sense. My organs functioned in a starved state, and my mind could not think or process information in a normal way. I could not “hear” or “see” clearly. I saw the world with distorted thoughts; and because I was so malnourished, I could not think like a normal person. The oddest thing about my state of being was that I thought I was totally normal! After all, every women on this planet was either talking about the diet she was on, or was at the gym trying to burn off calories. I thought that was normal. I lived for 22 months at $30,000 a month, in a so-called eating disorder treatment house in San Diego, CA. Clinicians and medical doctors controlled my every movement and breath. They told me what to eat, when to get up, when to exercise, when and what to read, when to watch tv, what to watch on tv, when to go to the bathroom, and when to go to sleep. If I so much as ate an extra string bean, the doctors punished me by taking away my phone privileges. Now that I look back, I think the doctors tried to brainwash me out of my eating disorder, much in the same way the fitness and dieting industries tried to brainwash me into believing in fitness “principles” that were totally outside of who I really was. I think people did not understand how utterly painful and lonely my world was. I don’t think any healthy functioning person can really understand. They may have sympathy and empathy, and try to listen, but NO ONE truly understands unless they have an eating disorder themselves. Ironically, I sought Scott out because I thought he would put me on a “healthy” diet and exercise program. 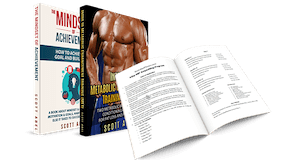 At the time I sought out Scott, I was acting out my fitness and dieting obsession by becoming interested in fitness competing; and again, wanted that “fitness body” type. I thought Scott would give me a ticket to that world; he was a professional and had trained many fitness competitors. I thought he knew how to do it right. However I also secretly knew Scott told the truth about women with eating disorders. He said things I knew to be the real truth, except that I did not want to admit them to myself. I knew in the back of my mind that I was using food and dieting as a Band-Aid for my emotional wounds. I knew in the back of my mind that women in fitness competitions were trying to legitimize their food and body-image obsessions. I just needed someone as blunt as Scott was with his words to tell this to me personally. I was ready to give up the food obsessions but felt like I needed permission to do so. I wanted Scott to tell me those women who competed in figure competitions were going on these extreme diets to cover up their issues with body image and a sense of self. I was like an alcoholic wanting to give up my obsession with drinking but who also wanted to keep drinking. I needed someone to tell me “stop drinking”—stop obsessing about food, stop dieting, stop reading fitness magazines, stop spending all day on fitness websites. If a person is truly addicted to alcohol in the clinical sense, then one cannot recover from alcoholism by having a couple of glasses of wine every night. Likewise, I thought this was the same with my obsession with food. I would never heal if I kept dieting and obsessing about fitness. So Scott and I focused on my daily struggles with life’s daily activities, with my relationships with friends and colleagues, with my marriage, and with my career. I forced myself to NOT talk about food and my behaviors around food. I learned through my check-ins with Scott to become aware of how I was feeling at any given time. I also learned how utterly hard I was on myself all the time. I was constantly judging myself. As part of my healing process, I learned to simply accept my feelings and not judge them. I was ok as I was and did not have to hate myself. I also learned in my coaching with Scott about my fear of being human. I had coped throughout my whole life by being “insecure.” I had used being insecure as an excuse to not be a real person. . Scott also helped me become aware of my dysfunctional thoughts and inappropriate, useless ways of dealing with my emotions. Because I had used food as a coping mechanism for such a long time, I had to learn how to heal emotionally without using food as a crutch. Today, I have a completely different approach to life. I wake up each day excited about what am about to learn in the next 24 hours. I am more excited about how I feel more than I am about any specific event. I get excited about the simple little things in life. I am learning how much I love animals, how much I like to help people learn about themselves. At the time I met Scott, I was working as a part-time Ph.D. dissertation editing; today, I am thriving as an editor who helps Ph.D. students write their theses. I love reading about their research topics and receive a tremendous amount of gratification from helping Ph.D. students write their dissertations. I see each opportunity to help another person as a gift. I am also currently developing a career in helping dogs live great lives. I am surrounded by dogs all day, and nothing makes me happier than being around a bunch of wagging tails. I am also learning how to nurture my marriage and my relationships with people I care about. Human beings are so interesting…much more interesting than dieting! Jenny enjoying her new hobby, ballroom dancing. During my second year with Scott, I discovered a new hobby—ballroom dancing. 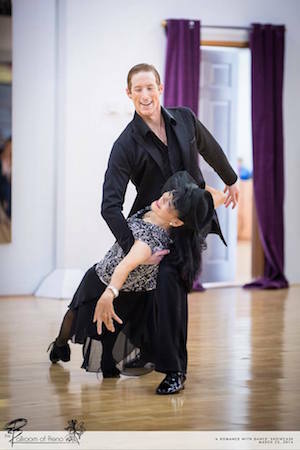 As a former concert pianist and jazz dancer, I knew I needed a creative outlet for my musicality, and Scott is helping me nurture my love for expressing myself through music and dance. I am still with Scott, because I do not believe I will ever stop learning about myself. I am constantly growing; with each discovery, I try to understand more about myself. I find it hard to say anything to anyone with an eating issue. All I can do right now is understand why they are obsessed with food, and hope they will come to realize themselves how futile dieting and controlling their food intake is. I think someone in my past shoes has to reach a point internally to actually want to live a different way of life. As long as someone with an eating issue is getting something out of her obsessive behaviors, that person will not change. Change is difficult. A person has to really want to change in order to truly change. My approach has always been different. We need to replace obsessing about food/eating/weight and body-image with something far more engaging and self-identifying and self-expressing. Next, editing PhD dissertations gave her analytical mind something else to do and engage with. What all of the above shows is that Jenny got past one of the most intense and longest duration eating disorders you could ever know – not by battling with it, and fighting with it – but by learning how to just “let it go” – by finding and engaging with more self-expressive, self-nurturing activities specific to her personality and abilities. Of course this requires a long-term approach. This is everything. Every statement she made I have lived, though I was never able to access treatment, and wasn’t as physically ill as she became. I went into recovery when I found Scott and heard truth I could finally recognize. Once recognized, it somehow also gave me the “permission” to acknowledge that I had was in the grip of eating and body image disorders, and needed to go into recovery. I will never forget the first time I said, out loud at 40 years old “I have an eating disorder”, and then finally, some months later, “I am in recovery for disordered thoughts and behaviors around eating and body image”. I too find it difficult to speak with those I see in the grip of disorder, because I remembers so well how those conversations would quickly become about validating thoughts and behaviors of disorder. I never want to have another conversation like that with another woman again. What an honest and eye opening post. Very brave of you to tell your story Jenny and congrats on your ongoing recovery. One thing that I learned through communication with Coach Abel is that Fitness, in the mainstrean manner, is hardly ever the solution. It masks and gives an excuse for more obsessive behaviour. Your story is further proof of this. I hope you stay on the path to wellness and God Bless you.